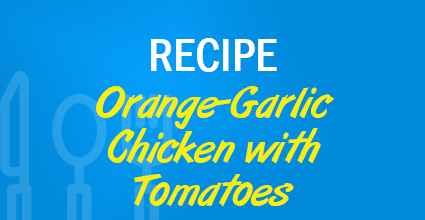 This chicken serves up a fresh burst of flavor with a side of wow! Cook rice according to package directions. Fluff with fork and fold in orange zest. Meanwhile, heat a large skillet on medium-high heat. Rub chicken with oil and season with ½ teaspoon each salt and pepper. 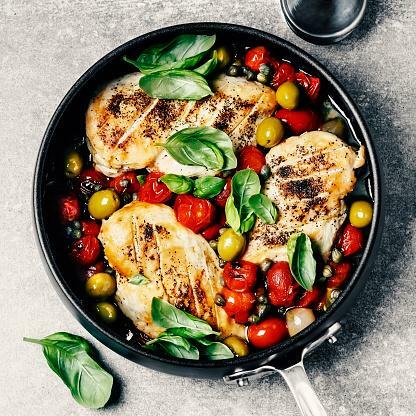 Place chicken in skillet, skin-side down, and cook until golden brown and crisp, about 13 minutes. Flip and cook 1 minute more. Remove from pan and set aside. Add garlic to skillet and cook, stirring constantly, for 1 minute. Add orange juice and cook, stirring constantly and scraping bottom of skillet for 1 minute. Add tomatoes and cook, tossing occasionally, for 3 minutes. Nestle chicken into tomato mixture, transfer skillet to oven and roast until cooked through, 5 to 6 minutes.